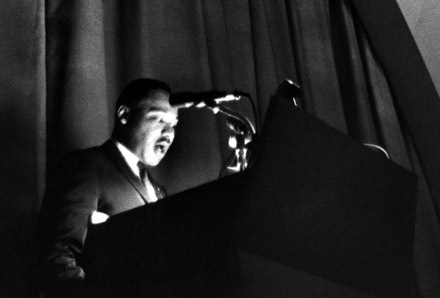 Martin Luther King Jr. speaks at The New School during the American Race Crisis lecture series in 1964. For nearly 50 years, The New School housed a treasure unbeknownst to anyone. Never-before-heard audio recordings of Martin Luther King, Jr., Louis Lomax, Roy Wilkins and others—speaking in the university’s American Race Crisis lecture series—sat hidden in the Kellen Design Archives. That is, until they were discovered in 2011 by New School for Social Research student Chris Crews and brought to the attention of New School archivist Wendy Scheir and then-Eugene Lang College student and editor of The Free Press Miles Kohrman. “When I first heard the recordings, I was blown away,” said Kohrman, now an alumnus. “I thought, ‘why don’t more people know about this?’” Thus began the process of organizing this month’s Voices of Crisis, a lecture series and exhibit that explores the American Race Crisis lecture series held at The New School in 1964. Under Scheir’s guidance, Kohrman began planning a month-long exhibition at the Sheila C. Johnson Design Center to showcase the audio recordings, transcripts of speeches, and photographs from American Race Crisis. But realizing that the scope of the project could be broadened, he decided to reach out to Khalil Gibran Muhammad, director of the Schomburg Center for Research in Black Culture. In three public programs in February, contemporary public figures examine the outcomes and ongoing progress of the civil rights movement. Speakers include C. T. Vivian, one of the most well respected members of the civil rights movement, and Harry Belafonte, actor, longtime activist, and former New School student. The Voices of Crisis exhibit will be on display at the Sheila C. Johnson Design Center from February 12 through March 6. Learn more about the Voices of Crisis lecture series here.